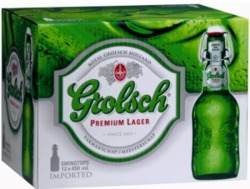 Grolsch is part-owned by coors in the UK, but the royal Grolsch company of Holland still brews this beer, in the swing top bottle, a big-brand lager that I've always considered on of the best of its type. It pours a fairly deep gold with a decent white head. The nose is nettly and hoppy, with lots of pungent vegetal notes and a hint of toast. On the palate theres a nice play between bitter hops and a certain sweetness in the finish, and theres a nice supporting malt that adds a bit of weight.